Because a diamond’s proportions have such a profound effect on its brilliance and overall appearance, GIA conducted a 15-year study to model the way light behaves within a round brilliant diamond. The result was a revolutionary cut grading system for round brilliants, incorporated into GIA Diamond Grading Reports in 2005. The Institute continues to explore the complexities of diamond cut, particularly for fancy cuts. Research into more consistent, accurate clarity grading is also under way. 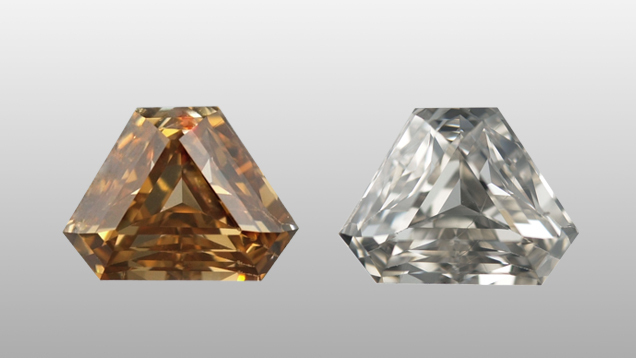 Because of their rarity, naturally colored diamonds have high price-per-carat values. Fancy diamonds have enjoyed unprecedented popularity in recent years, and articulating their color and cause of color has never been more important. Research into these diamonds' color origin continues to enhance GIA's colored diamond identification services. Three categories of diamonds have been associated with a natural blue color: (1) type IIb, which are colored by boron impurities; (2) those type Ia or IIa that owe their color to radiation exposure; and (3) those type Ia in which the color is associated with hydrogen. 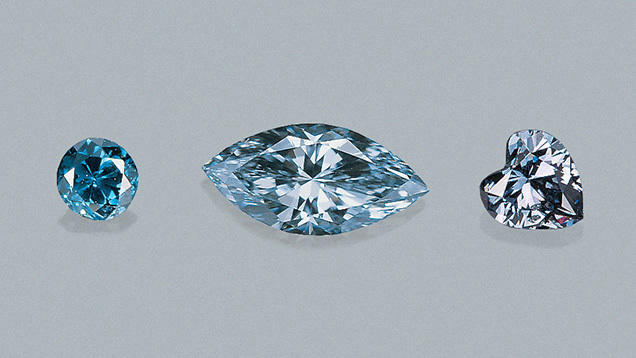 Of these, only type IIb diamonds (like that in the center) are typically described as blue (without a hue modifier) in the GIA GTL colored diamond color-grading system. Those naturally colored by exposure to radiation are usually described as green-blue (left), whereas those colored by color centers associated with hydrogen are described as gray-violet to gray-blue (right). 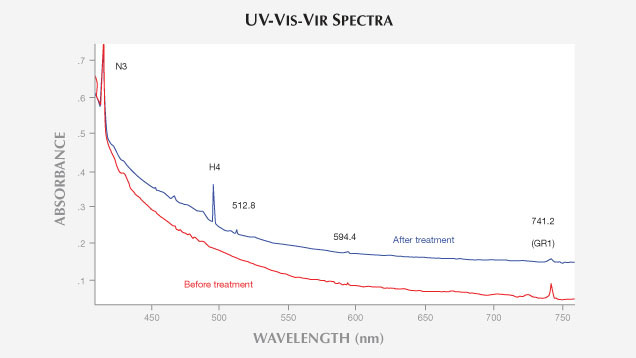 In addition to color-changing treatments such as irradiation and high pressure/high temperature (HPHT) annealing, GIA researchers are committed to detecting clarity enhancements such as laser drilling and fracture filling. 6.61 ct diamond, before and after HPHT annealing to remove its color. Left: Before anealing, fancy yellow brown, right: After annealing, "L" (faint yellow). Since reporting on General Electric’s first cuttable synthetic diamonds in 1971, GIA has been on the leading edge of synthetic diamond research. This includes the detection of goods produced by high pressure/high temperature (HPHT) synthesis and, more recently, chemical vapor deposition (CVD). Graphitized feathers in a diamond may indicate HPHT treatment. The geographic source of a ruby or sapphire often has a dramatic effect on its market value. Institute researchers take many steps to accurately identify the geologic and geographic sources of colored gemstones in GIA's country-of-origin reports. 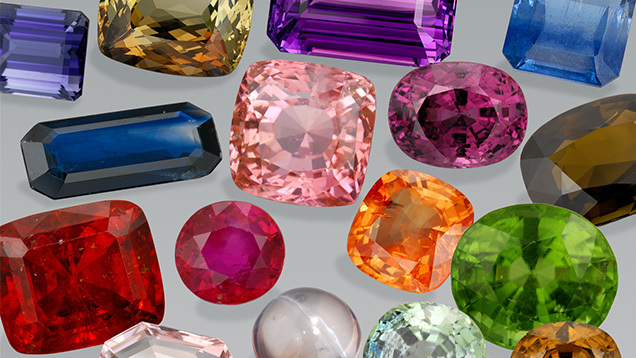 Heat-treated sapphire, beryllium-diffused sapphire and glass-filled ruby are just a few examples of treated corundum. These enhancements often go undisclosed, and GIA researchers work hard to investigate these artificial enhancements and uncover the means of detecting them. The orange and blue flash effect seen in a lead glass-filled ruby. Magnification 30x. The recent discovery of naturally occurring beryllium in corundum means this material must be studied to avoid confusion with corundum that has been beryllium-diffused to alter its color. In many cases, classical gemological methods such as the microscope, refractometer and handheld spectroscope are no longer sufficient in identifying a treated or synthetic gem material. 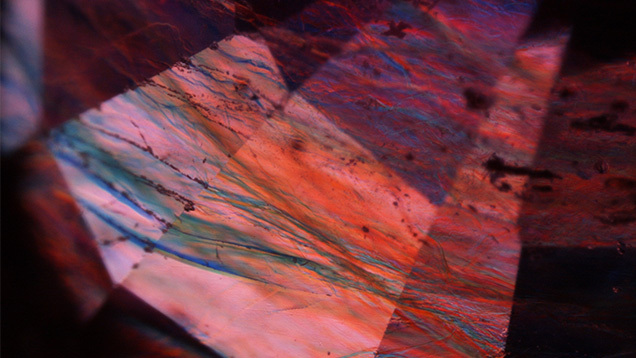 Techniques such as absorption and luminescence spectroscopy offer more sophisticated means of gem identification. Besides improving GIA's commercially available gem instruments, development of these technologies will enhance the Institute's research and identification efforts. 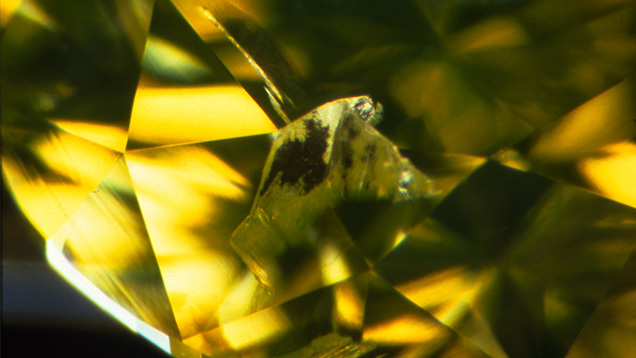 Spectroscopy can detect gem treatments: the spectrum of this 24.16 ct. diamond showed distinctive features that weren’t present prior to irradiation in a laboratory to change its color. The practice of coating gemstones dates back thousands of years. With technological progress, though, coatings have become more durable and harder to identify. 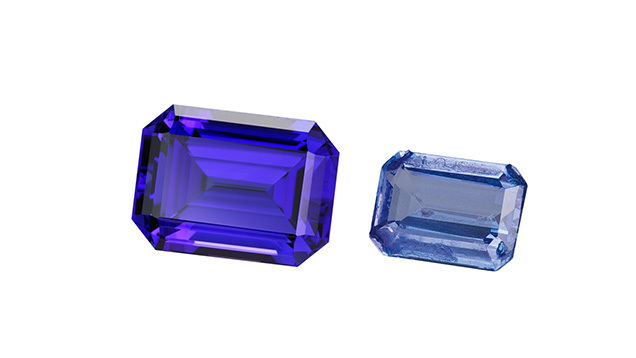 One such product GIA continues to probe is cobalt-coated tanzanite. This project involves testing and recording data on the more than 2,800 gems GIA purchased from the estate of renowned Swiss gemologist Dr. Edward J. Gübelin. This data will be made publicly available for research and educational use. To achieve an attractive and consistent color, cultured pearls are frequently treated by bleaching, dyeing or irradiation. GIA researchers track these developments and also examine rare natural pearls. 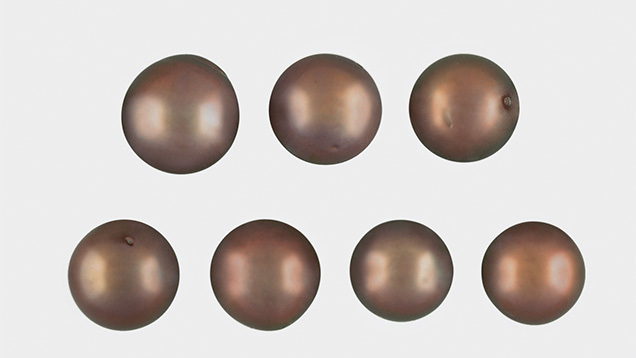 These seven Tahitian cultured Chocolate Pearls (10.50 - 12.53 mm), treated by Ballerina Pearl Co. using a proprietary bleaching method, were studied to evaluate their durability to various conditions of consumer wear. The samples are in order (CCP-1 to CCP-7) from left to right, top to bottom.